All of south Mumbai and parts of central Mumbai are without power on Tuesday after a unit of Tata Power tripped. Nearly 40 per cent of the city has been hit, according to media reports. A statement by Tata Power Company Limited, which distributes power to many parts of Mumbai, said: "Today, on September 2 at 09:45 hours, the power supply was affected due to tripping of Unit #5 of Trombay Power Station. This tripping has resulted in load reduction of Parel, Mahalaxmi, Dharavi, Chembur and Gr Road area of Mumbai to control loading on 220Kv Kharghar-Nerul-Sonkar-Trombay tie line." "We are working towards an early resolution and will ensure power supply to these areas at the earliest. We would like to reiterate Tata Power's commitment to providing reliable and 24X7 quality power to the city of Mumbai," the statement added. Tata Power sources said that the supply of electricity will be restored by 4 pm. Reliance Power, which also takes electricity from Tata and sells it to some Mumbai areas, tweeted that Tata Power has imposed rotational load shedding in Chembur, Bandra, Kurla, Santa Cruz, Ghatkopar, Tikar Nagar, Vikhroli, Saki Naka and Juhu. Several people are reportedly stuck in high-rises after elevators shut down because of a lack of backup power supply or generators. In a tweet, Anand Mahindra, chairman of the Mahindra group, said the power cut was likely because of a coal shortage. 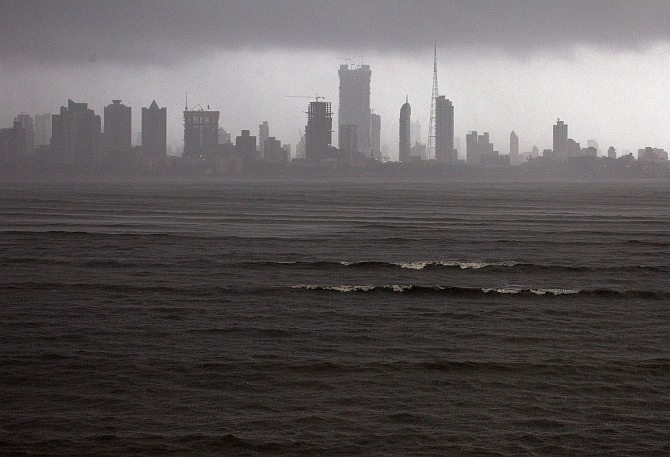 Mahindra Towers in Worli, which houses the corporate offices of the group, was also without power. Have you been affected by the power cut in Mumbai? Share your experience in the message board below?